A central component of digital humanitarian response is the real-time monitor-ing, tagging and geo-location of relevant reports published on mainstream and social media. This has typically been a highly manual and time-consuming process, which explains why dozens if not hundreds of digital volunteers are often needed to power digital humanitarian response efforts. To coordinate these efforts, volunteers typically work off Google Spreadsheets which, needless to say, is hardly the most efficient, scalable or enjoyable interface to work on for digital humanitarian response. The challenge here is one of design. Google Spreadsheets was simply not de-signed to facilitate real-time monitoring, tagging and geo-location tasks by hundreds of digital volunteers collaborating synchronously and asynchronously across multiple time zones. The use of Google Spreadsheets not only requires up-front training of volunteers but also oversight and management. Perhaps the most problematic feature of Google Spreadsheets is the interface. Who wants to spend hours staring at cells, rows and columns? It is high time we take a more volunteer-centered design approach to digital humanitarian response. It is our responsibility to reduce the “friction” and make it as easy, pleasant and re-warding as possible for digital volunteers to share their time for the better good. While some deride the rise of “single-click activism,” we have to make it as easy as a double-click-of-the-mouse to support digital humanitarian efforts. This explains why I have been actively collaborating with my colleagues behind the free & open-source micro-tasking platform, PyBossa. I often describe micro-tasking as “smart crowdsourcing”. Micro-tasking is simply the process of taking a large task and breaking it down into a series of smaller tasks. Take the tagging and geo-location of disaster tweets, for example. Instead of using Google Spread-sheets, tweets with designated hashtags can be imported directly into PyBossa where digital volunteers can tag and geo-locate said tweets as needed. As soon as they are processed, these tweets can be pushed to a live map or database right away for further analysis. The Standby Volunteer Task Force (SBTF) used PyBossa in the digital disaster response to Typhoon Pablo in the Philippines. In the above example, a volunteer goes to the PyBossa website and is presented with the next tweet. In this case: “Surigao del Sur: relief good infant needs #pabloPH [Link] #ReliefPH.” If a tweet includes location information, e.g., “Surigao del Sur,” a digital volunteer can simply copy & paste that information into the search box or pinpoint the location in question directly on the map to generate the GPS coordinates. Click on the screenshot above to zoom in. The PyBossa platform presents a number of important advantages when it comes to digital humanitarian response. One advantage is the user-friendly tutorial feature that introduces new volunteers to the task at hand. Furthermore, no prior experience or additional training is required and the interface itself can be made available in multiple languages. Another advantage is the built-in quality control mechanism. For example, one can very easily customize the platform such that every tweet is processed by 2 or 3 different volunteers. Why would we want to do this? To ensure consensus on what the right answers are when processing a tweet. For example, if three individual volunteers each tag a tweet as having a link that points to a picture of the damage caused by Typhoon Pablo, then we may find this to be more reliable than if only one volunteer tags a tweet as such. One additional advantage of PyBossa is that having 100 or 10,000 volunteers use the platform doesn’t require additional management and oversight—unlike the use of Google Spreadsheets. There are many more advantages of using PyBossa, which is why my SBTF colleagues and I are collaborating with the PyBossa team with the ultimate aim of customizing a standby platform specifically for digital humanitarian response purposes. As a first step, however, we are working together to customize a PyBossa instance for the upcoming elections in Kenya since the SBTF was activated by Ushahidi to support the election monitoring efforts. The plan is to microtask the processing of reports submitted to Ushahidi in order to significantly accelerate and scale the live mapping process. Stay tuned to iRevolution for updates on this very novel initiative. 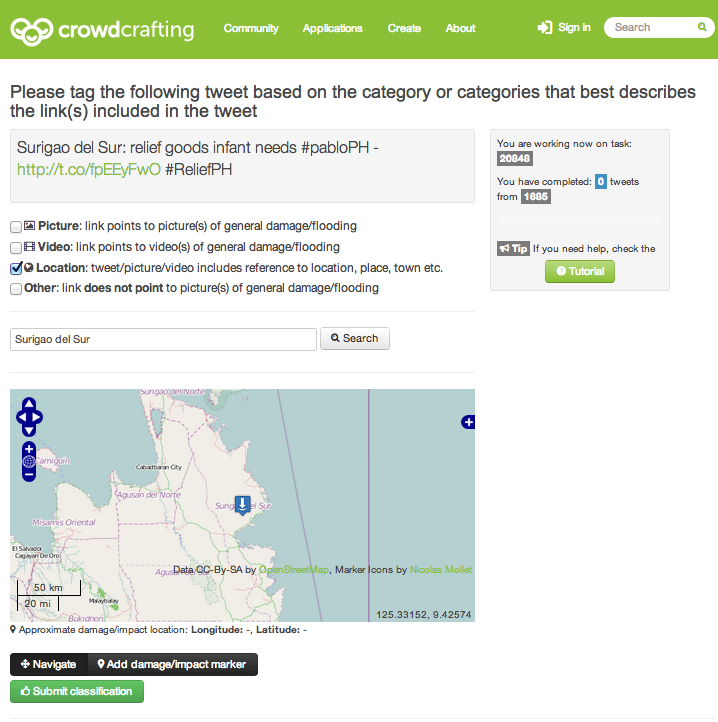 The SBTF also made use of CrowdFlower during the response to Typhoon Pablo. Like PyBossa, CrowdFlower is a micro-tasking platform but one developed by a for-profit company and hence primarily geared towards paying workers to complete tasks. While my focus vis-a-vis digital humanitarian response has chiefly been on (integrating) automated and volunteer-driven micro-tasking solutions, I believe that paid micro-tasking platforms also have a critical role to play in our evolving digital humanitarian ecosystem. Why? CrowdFlower has an unrivaled global workforce of more than 2 million contributors along with rigor-ous quality control mechanisms. While this solution may not scale significanlty given the costs, I’m hoping that CrowdFlower will offer the Digital Humanitarian Network (DHN) generous discounts moving forward. Either way, identifying what kinds of tasks are best completed by paid workers versus motivated volunteers is a questions we must answer to improve our digital humanitarian workflows. This explains why I plan to collaborate with CrowdFlower directly to set up a standby platform for use by members of the Digital Humanitarian Network. 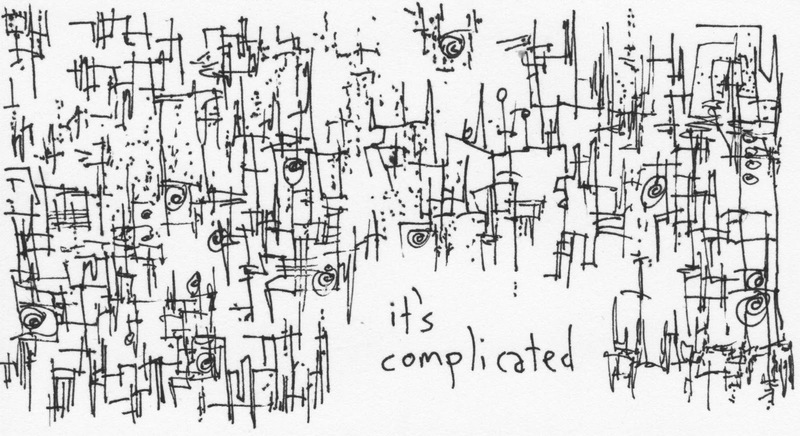 There’s one major catch with all microtasking platforms, however. Without well-designed gamification features, these tools are likely to have a short shelf-life. This is true of any citizen-science project and certainly relevant to digital human-itarian response as well, which explains why I’m a big, big fan of Zooniverse. If there’s a model to follow, a holy grail to seek out, then this is it. Until we master or better yet partner with the talented folks at Zooniverse, we’ll be playing catch-up for years to come. I will do my very best to make sure that doesn’t happen. This entry was posted in Crowdsourcing, Humanitarian Technologies, Social Media and tagged Crowdflower, Disaster, Gamification, Humanitarian, Micro-Tasking, microtasking, Pybossa, Response, SBTF, Volunteers, Zooniverse. Bookmark the permalink. ‘Microtasking’ at Patrick Meier’s iRevolution blog. I totally agree with you, especially with what you say about gamification. This is the cornerstone of every future evolution of this sector, and not only this one. Khan Academy started this in the education realm, with math-related games and challenges that even someone as math-repelled as myself can enjoy. We see an ever growing number of state-of-the-art designed websites that focus on showcasing how good looking and entertaining their interface is. We (digital humaniatarians, analog humanitarians, emergency managers…) need to understand that combining crowdsourcing and microtasking with this web esthetics and functionalities gives us access to the vastest of resource pools, in which possibilities are truly endless.